I'm always changing the vignette in this little corner next to the sink. The teapot lamp is a constant and I recently added my favorite photo of Dexter and I. The green frame is the same green as the cabinet sample. To the left of the sink is an apothecary-like dish soap dispenser that I keep refilling. I love its elegance. It sure looks better than the Palmolive squirt bottle! 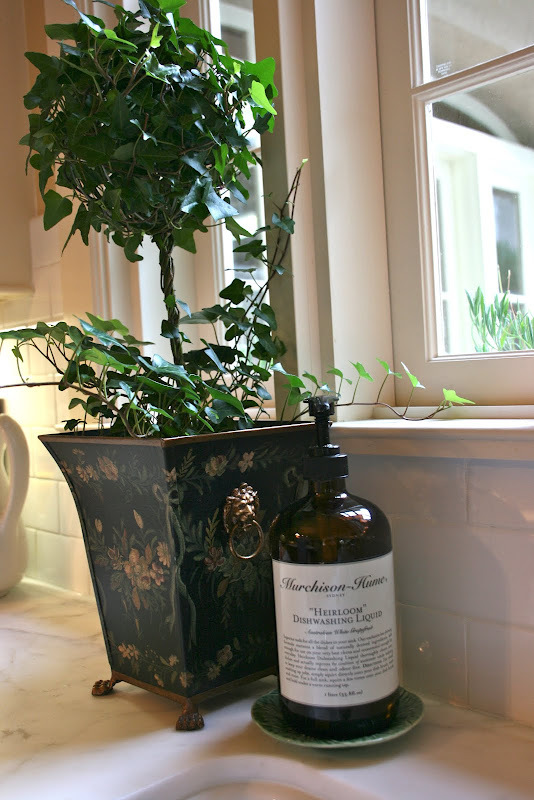 A pair of ivy topiaries in tole planters flank both sides of the sink. I like how they stand out against the white marble and tile. And that's my kitchen vignette on a gloomy March evening. I added one more thing. A grocery store bunch of daffodils not only smells good, but is a spot of sunshine inside while it rains cats and dogs outside. Wishing you all a fantastic week! Spring is just around the corner! I love your post. You are style has so much elegance. By the way, do you have a good source to find beautiful picture frames. I admire all your picture frames. I find all my frames at either TJMaxx or Marshalls. Never pay more than 7.99 for them either! I also have some gorgeous soap dispensers designed for one use, but I want to keep refilling, so I protected the labels by covering them with some handy-dandy clear pastic packing tape. Tah-dah! Laminated. Beautiful photo and your kitchen looks so elegant! Ok stop the press, Dexter is too cute, I want a Dexter too! I love the fact you make even the dishwashing area a great place to work at. 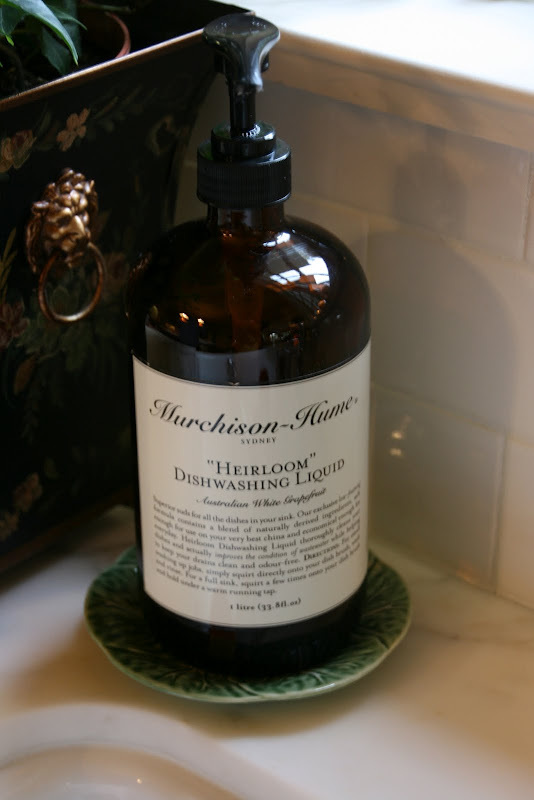 I havent come across the Muchison-Hume brand but it certainly elevates the style factor from the usual gaudy coloured bottles. Very smart Delores. I found the bottle at Anthropologie on sale a year ago. The label is great because it doesn't come off. My poor little Dexter was the cutest ever. Sure do miss that little guy. I decant my dish soap too, it makes me a better washer-upper because I don't hide it away any more. Love your vignettes as always Delores, and so intrigued by what appears to be a fin on top if your car. Don't tell me you floofed your ride? I love your new vignette and what a lovely kitchen you have! Love everything you do. Oh Tricia, too funny. That is Gary's river boat all propped up to drain the water out! Looks like a fin! haha! Gosh you just have such a knack! 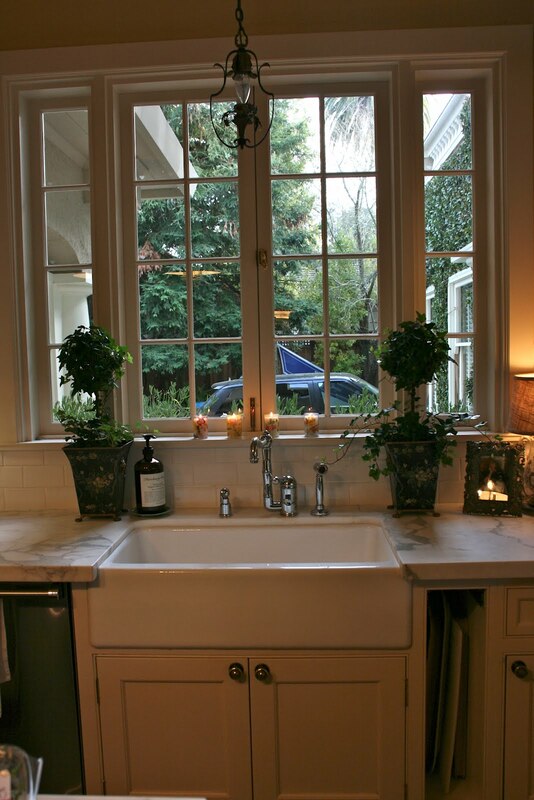 Your ivy topiaries look sooo good on either side of the sink and I love the photo of you and Dexter. Wishing you sweet memories of him, and a happy Spring. Love the cheery flowers and the candles. The teapot lamp is awesome too! Love your vignette's new look, as well as your topiaries and beautiful pop of yellow daffodils! Love the topiaries and the picture of you and Dexter in that lovely frame. Can't wait to see your kitchen cabinets!! Isn't it funny how just a little tweak here and there, can make us happy? New little votives on the windowsill, grocery store daffodils? Simple, but everytime we tend to our senses.......it pays off. I love the picture of you and your sweet Dexter. Ι love your kitchen! !So chic! !